The following is a list of issues that frequently impact on the safety of cyclists, and that may not currently be addressed in maintenance activities. It is important that inspectors and maintenance personnel understand how these issues impact on cyclists, the urgency of carrying our remedial works, and the detail of how they are best remedied. These are extremely dangerous to cycle on when wet. 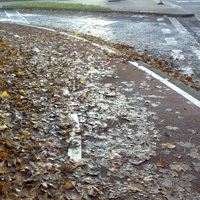 If cyclists have to stop, turn or veer on surfaces with wet leaves, they are likely to lose control and fall over. Leave are a major cause for blocked drains, ponding etc. Most local authorities have a well-developed urban lighting maintenance programme, operated in conjunction with the Electricity Supply Board (ESB). 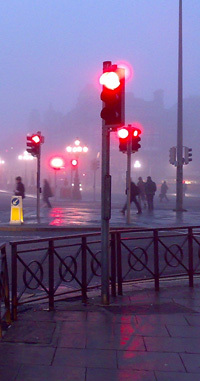 As bulbs wear out, or light poles are damaged, the local authority lighting inspectors systematically notify the ESB for attention. Winter gritting and road works / reinstatements tend to deposit grit and small stones at the edge of the road where cyclists ride. If cyclists pass across grit or larger loose material, (especially with narrow “racing” wheels), this can result in loss of balance and result in accidents. While surface failure can occur anywhere, there tends to be more wear and tear on bus routes. Buses end to be the slowest moving and heaviest vehicle in urban roads and streets. 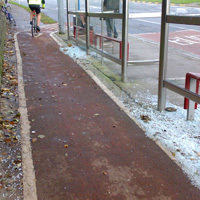 They are a major cause of surface deterioration, especially regarding rutting (around bus stops and slow sections of route) and joint failure (where there are construction or reinstatement joints near the kerb or the bus wheel running track). 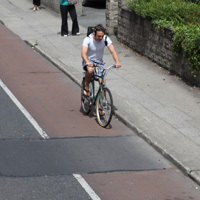 For cyclists in shared bike /bus lanes, or on cycle lanes beside bus lanes, it is important that the surface is of good quality, so that the cyclist spends as much time as possible looking ahead and around (at traffic movements) instead of looking down (to avoid failed surfaces). Avoid location of ironmongery in vicinity of bus stops, as these may sink / stand proud of the rest of the bus stop surface over time. 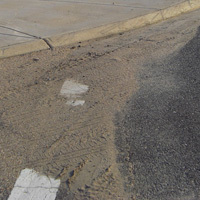 If drainage is necessary at the bus stop, install side-draining gullies. Replace conventional gullies with side draining gullies if differential settlement is occurring. The principal surface defects are potholes, break up of coloured surface, poor reinstatement of previous roadworks, joint movement etc. Depending on the degree of deterioration, these can affect cycling safety. These basic and reasonably obvious problems continue to be a hazard to cyclists, and should be eliminated from the street and road network. Choose side draining gullies / kerb arrangements in preference to channel-located gullies. Choose flat grill gullies in preference to slotted gullies. 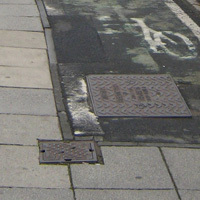 Ensure that ironmongery is raised as part of any road or street overlay – failure to do so may result in excessive edge-of-road camber, and / or sunken lids and covers, neither of which are conducive to cycling. On-site supervision of all ironmongery during installation, to preclude poor choice or alignment of gullies. Ponding affects cyclists directly: the standing water can render routes impassable, by slowing bicycles down to a stop; the ponding can hide hazards (debris, holes etc.) making the route dangerous; it can also make the route slippy, and difficult to use brakes on. 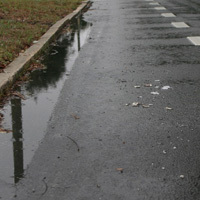 Ponding and poor drainage can also indirectly affect cyclists; spray from the road can make it difficult for drivers to see cyclists; passing vehicles can spray pedestrians and cyclists by driving through kerbside water. Finally, ponding water (especially coupled with freezing temperatures) can have a significant impact on the integrity of the road surface, with risk of potholing. Roots and weeds tend to be a problem that is associated with cycle tracks. As cycle tracks have significantly less construction depth, it is easier for roots to undermine the cycle track, and “pop” the surface. 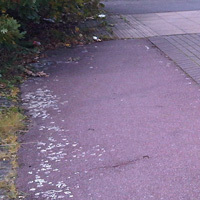 Again, systematic spraying of weeds tends to deal with road and streetside weeds, but on cycle tracks, weeding tends to affect longitudinal joints at the edges of tracks, as well as undermining the surface. Road line visibility is an important contributor to the Legibility of a design. Worn markings will be less visible in the dark and wet, and make result in the driver (or cyclist) misreading the road layout. Visible road markings are a requirement for successful penalising of drivers who disregard such markings. 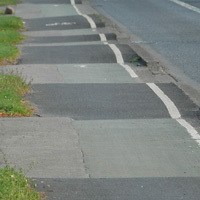 Locally worn road markings may be an indication of significant vehicular traffic crossing or driving along the road line – this may not be as the design was intended.